Hello there, are you still excited to know more about dogs? If it is yes, today we will learn about simple things but it is a must. It is an important thing especially you as the new owners. Well, when you adopted a dog or you pick a dog in the street to a home. In here you should handle your dog in his first night at your home, right? 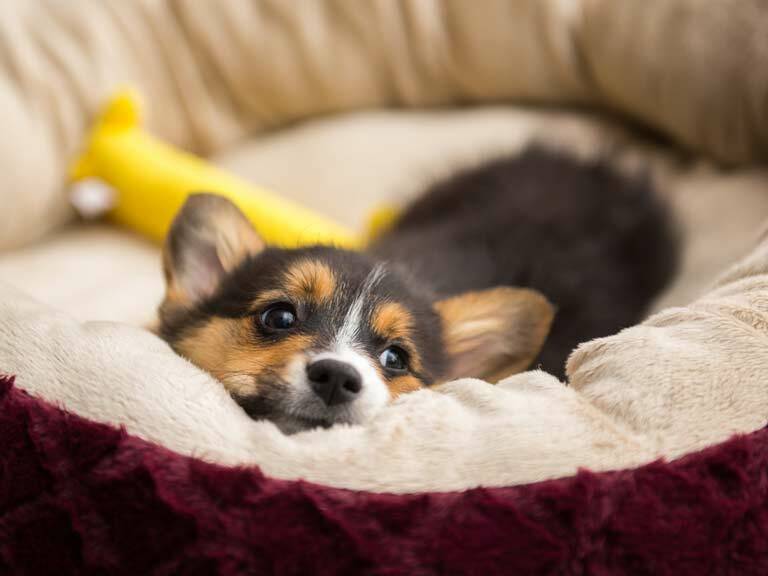 So, the big question is how to handle your dog’s first night at home? What are the things that the dog’s needed? Here are we go the answers. First, after taking him or her to your home give your dog a breathing space. Let he or she adapt with his or her new house. Let he or she sniffs around your house to make a mark that now your house is his place. Well, your dog is suddenly out from the big world now he or she will be safe because you are now his or her owner. Have you prepared where he should sleep? A sleeping spot, you can put him or her in a place that clean and comfy. If the dog is small you can take him or her into a cage or you can place it in a room with a blanket and fluffy pillow. Let him or her to take a rest. It is a must to feeding your new dog, make sure his or her food lots of protein and carbohydrate and it is right (the type of his food) for your new dog. However, if you do not have any dog’s food you can give him the human’s food. such as cheese, chicken, yogurt, eggs, salmon even a bowl of oatmeal. These are some of the healthy human food that can eat by your dog. Well, it is an important thing that you should do to give your dog a name. You can start it with giving him or her a short name. Make sure you pick a short name that does not similar to a command. If you want to give him or her a name with your friend or family’s name you should ask them first (permission). Other ways, you can explore it with searching on the internet, books or even your favorite movie. Your dog will say “bark” (sounds happy) if you give the right name. Okay, this is his or her first night in your home so you do not know how is his or her behavior, right? So, keep your eyes on him or her. He might like to bitting things or take a pee or poop on the floor even on the sofa and even he could make some mess everywhere. What you have to do is give a command and train your dog to be a good dog. You can say stop it, or just please in here or else. If your new dog does not hear your command you should see on this the tips on how to make a dog listen to your command. Okay, let’s do simple potty training to your new dog with a litter box first. So in here, you should prepare a litter box and also the sand (for pets) or you can use ash powder. Put in the litter box some of the ash powder or sand (a quarter of the litter box). Then, introduce to your dog that this spot is a place for him to take a pee or poop. Carry your small dog and put in into here, let he or she sniffs it. However, if your dog is big, you can show a potty spot like in your back yard. If you want to potty training him with use a bathroom you might to see in here, some tips on how to train your dog to use a bathroom outside. Next, to entertaining him or her you can buy some dog’s toy. He or she might to happy see a softball, a tiny doll, even a chew toys. He or she will love it. If you have a large backyard, you can make a little playground for him or her to play. With this, you can train him or her by yourself. It is one of the easy tips on how to make your new dog being a good boy or girl. How to make your dog feel comfortable? All pets like their home clean and also neat. So, keep your house is clean and always neat. His or her cage should clean and neat as well. You can make a schedule when you should clean his or her dirty cage, at least once a week. Otherwise, the dog needs healthy food to fulfill his energy, and also give them some treats to make them happy or while your dog listens to your command. Last, a thing that makes a dog feel comfortable is love. So, love your dog as well as you love yourself. You can train your first dog or your new dog with a simple command, such as sit, stand, rolling, even make a high five. Train your new dog a simple command everyday within 30 minutes per day. He or she will understand it quickly. We know, that dog is a pet that easier to train than a cat. He can catch what we give (a command) in a shorter time. Give him a reward also punishment too while your dog does the good or the bad things. Are you have another pet in your home? What are they? Well, you have another dog again in your home, two little bird and also a pair of goldfish. So how to manage a new pet in your home? First, make sure you understand how to manage them (your old pets). If the other pets are in their place, it is good. It will no problem. However, in this case, you have another dog. As a good owner, you should introduce to your old dog and say that both of them are your lover. In this case, take care of both your dog in the same way. Do not give any special treatment at one of them. Your dog will be jealous of you. Hopefully, the above on how to handle with the dog’s first night at home can be a benefit for you. Please, see more informations too about dogs on what you need to prepare for your dog’s first camping trip, causes your dog suddenly seems tired and also some ways to stop your dog from running Away So, please handle and take care of your dog peacefully with love. Good luck.